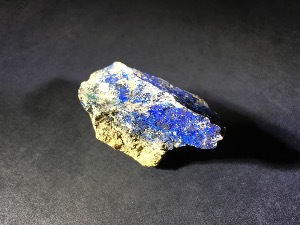 Azurite is a cooper carbonate mineral. 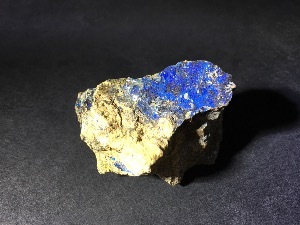 It’s name is derived from it’s deep azure blue colour. 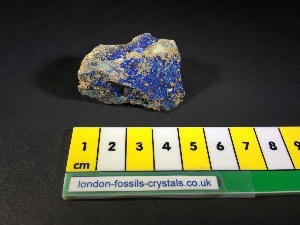 It’s crystal system is monoclinic and, although it is most often found in massive or botryoidal forms, it sometimes grows in long, deep blue, prismatic crystals. It also occurs in stalactitic, columnar or radiating forms. It frequently appears in combination with Malachite, another copper carbonate, this one with a bright green colour. It is found in Australia, China, Chile, Russia and the USA. 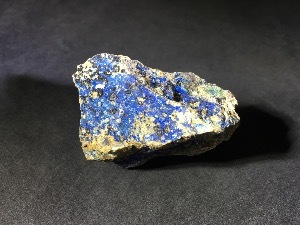 Particularly beautiful Azurites and Azurite/Malachites have been found in the copper mines of Bisbee, Arizona.